Indigenous life-worlds are in motion. This was the topic of a day-long film festival on October 27, 2017, at which seven filmmakers from Mexican indigenous communities presented their latest documentaries and feature films. The screenings showed innovative approaches in portraying indigenous people beyond the clichés of rural villages and harmony with nature. Through their search for education, work and adventure they have extended their range of activity: María Dolores Arias Martínez, Armando Bautista García, Yolanda Cruz, Carlos Pérez Rojas, Nicolás Rojas Sánchez, Genoveva Pérez Rosas and Romel Ruiz Pérez themselves have moved between Mexico, the United States and Europe. 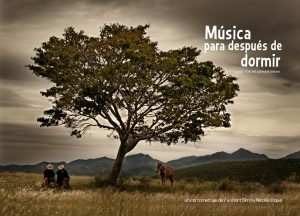 Their films vividly demonstrate how the Tsotsil, Chatino, Mixe/Ayuujk Ja’ay, Zapotecs and Mixtecs have created a home in different countries. On the one hand migrants cultivate cultural skills in their communities of origin; on the other hand they take this traditional knowledge along with them when travelling and use it to build bridges, which connect people between various villages and cities to a multi-sited ‘home’. Armando Bautista García, who comes from the Mixteca region and currently lives in Scotland, presented the short feature film Alma y Esperanza, which he produced and Itandehui Jansen directed. It tells the story of nine-year-old Alma, who lives in the United States. After her mother passes away, she is forced to return to her grandmother in Mexico, to a ‘home village’ and a culture foreign to her. Both search for a way to communicate and overcome the tragedy. 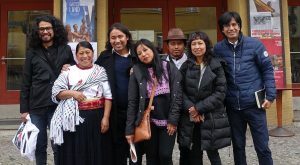 Alma y Esperanza is an example of the “diasporic” quality of indigenous film production methods and its outcomes. This motion picture was developed in a transnational setting between the Netherlands and Mexico, countries in which the filmmaker and the producer are rooted and which they connect through their professional networks. The protagonists are family members and friends, as in the case of Esperanza, the Mixtec grandmother, performed by Armando’s mother. 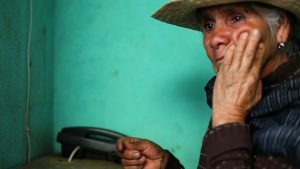 While offering a fresh perspective on the pitfalls of transnational lives, Alma y Esperanza portrays the Mixtec elder generation and the village of origin without romanticizing them. The movie’s images of the people, their houses with their everyday spaces and landscapes attest to ‘home’ being a crucial asset. They show how community also emerges through return from migration. ‘Home’ in the village of origin becomes a key resource in the context of the insecurities entailed in life between several countries or continents, particularly in the case of the many Mexican migrants with illegal status in the country of destination USA. The audience experienced up close such aspects of indigenous life-worlds through the impressive images projected at the Babylon cinema. Many in the audience remained for the marathon screening that lasted more than six hours Friday afternoon and evening. The classical dark cinema space, the accurately timed film screening of high quality copies and the collective experiencing of these presentations are elements that transform a movie theatre into an “affect generator”. I adopt this term from cultural scholar Andreas Reckwitz (2015, Praktiken und ihre Affekte, in: Mittelweg 36/1-2: 41) who conceives objects such as buildings and their rooms as part of aesthetic practices and as “affect generators” since they have often been specifically designed “to affect the subjects during their use of them”. In this case, the spectators and filmmakers in the Babylon movie theatre experienced the setting and the motion pictures in different ways. For many it became an eye-opener. The audience included people without knowledge of the Spanish language or experience in Latin America: Since the films were subtitled in English they could understand them, and since the Q & A sessions were translated into German they were able to participate by asking questions. Younger German viewers enjoyed the retro character and flair that cinema projections have assumed in the era of Netflix and YouTube and viewing films mainly on a notebook. 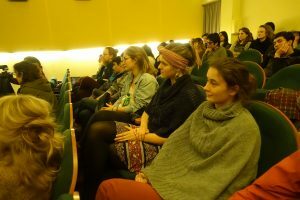 The filmmakers also experienced the screenings from diverse perspectives: Most of them are regular festival-goers whose movies have won prizes. However, this was the first time that two of the filmmakers showed their videos in a movie theatre: Although their fiesta videos are extremely popular, normally they are only disseminated on popular circuits (see below). María Dolores Arias Martínez showed scenes from her full-length documentary Tote (Grandfather), which is still in post-production. She herself is the movie’s protagonist. Narrating the film while driving in her Volkswagen beetle from the city of San Cristóbal de las Casas to the hamlet where her grandfather lives, she broaches the issue of belonging or rather non-belonging to this ‘home’. She therefore ponders: “I don’t feel as belonging to any place. Sure, if someone asks me, I say that I’m from Chenalhó, because that’s what my birth certificate says …”. But what does this Tsotsil village really mean to her? She is visiting to document her grandfather, with whom she had never engaged in any significant conversation. 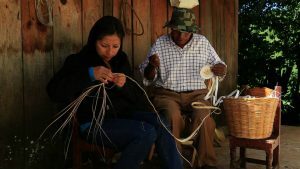 She does not feel “in place”, since being a “complete” woman there requires knowing how to make tortillas and to weave. Because her mother wanted her daughter to have a better life and not to suffer from discrimination as an indigenous person, she never taught her to speak Tsotsil. Moreover, she never hugged her child, so the film protagonist inquires what the word for “love” is in the Tsotsil language. The Tsotsil expression, which literally means “pain in the heart”, is the closest approximation. Responding to the audience’s questions about “love”, María Dolores Arias Martínez explained that thanks to her film project she learned that her parents and grandparents do practice forms of “love” and “tenderness”, even if they differ considerably from her own. Shortly before she died, her grandmother chose a second wife for her husband. That was her way of loving and caring. Yolanda Cruz, who lives and works in Oaxaca and Los Angeles, presented her recent short documentary Tlacolulokos; the European premiere was highly applauded. 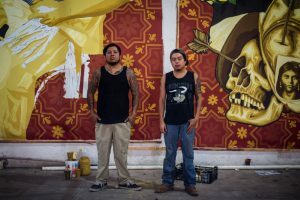 The film portrays graffiti artists Dario Canul and Cosijoesa Cernas from Tlacolula, Oaxaca, who form the art collective known as Tlacolulokos (the crazy guys from Tlacolula). They carry out their artistic work in the street as well as in conventional spaces of art production. 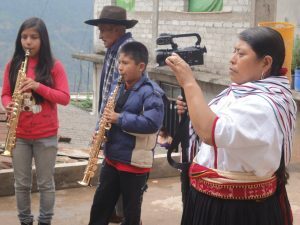 The documentary accompanies them as they work and reflect on the challenges that they and their Zapotec community encounter due to discrimination – one reason why they emigrate to the United States in search of a better future. Tlacolulokos captures these adversities from a different angle in the art of painting, such as their fresco entitled: “Smile now, cry later”. It features a young Zapotec woman with tattooed arms who dons traditional garb and proudly takes a selfie with her young brother. The Los Angeles Central Library commissioned Tlacolulokos to prepare a fresco that shows the contemporary dimensions of the Californian megacity: How the Zapotec indigenous people form part of the immigrant population from Mexico and now influence and enrich the United States with their culture. Tlacolulokos and Yolanda Cruz’s documentary portraying their endeavours capture the pain of families separated by a restrictive international boundary as well as the pride and joy created through the “Mexicanization of California”. The screening of fiesta videos made by Genoveva Pérez Rosas and Romel Ruiz Pérez was another highlight of the Babylon cinema event and a unique contribution. They both manage Video Tamix in Tamazulapam Mixe, where they produce movies such as the video of a spectacular ‘castle’ fireworks donated by migrants in the United States for the patron saint fiesta in their village of origin. Many villagers now live in the United States without documents and cannot afford to visit their hometown; therefore, they commission these films. Although professionally produced and widely disseminated transnationally as DVDs and through social media, fiesta videos are never screened in movie theatres. And yet they provide valuable insights into important social events in Mexico cherished by the migrant audience: The igniting of a giant fireworks display financed by a migrant couple; the ritual sacrifice of a chicken to ensure that the fireworks and the vow to the patron saint go smoothly; the inauguration of a village house constructed with migrant money and its consecration with corn and agave beverages; the festive meal for workers who helped construct the house; live music concerts that include traditional string music. 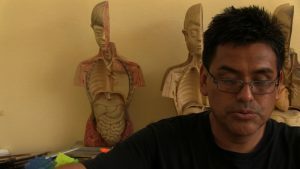 The full-length documentary Mëjk, Strong, tells the story of teacher Genaro Rojas, who is used to living far from his hometown and family and visiting on weekends. Genaro eloquently and with a great sense of humour takes us on a journey through the world of the Sierra Mixe in Oaxaca, Mexico. Humour is his strength, which enables him to explain how fragments of daily life that may appear to lack any meaning form part of the broader sociopolitical and philosophical context. During his office hours as a director of the remote elementary school in Guadalupe Victoria, he takes care to solve the case of a fake letter. For Genaro it’s a welcome occasion to explain to his young pupils the negative consequences of the new education reform of current president Enrique Peña Nieto. Director Carlos Pérez Rojas is from the Mixe region, but now resides in France. In sum, the movies and the Babylon film festival itself showed how the topic of affects is currently taking centre stage in the most recent indigenous film productions. Filmmakers and their pictures tackle the tensions and new challenges of migrant and diasporic lives. Due to mobility, people are experiencing abrupt changes in their life cycles, both in their villages of origin as well as in new settlements. Engaging with affects or “doing affects” has therefore become a concern of the movies produced for festivals, as well as the fiesta videos widely disseminated through popular circuits. All these films want to move their audiences, touch viewers’ hearts and enable them to experience different ‘homes’ in various places with all the senses.